An admired British writer, Edward Strathairn returns to the hotel in Japan in which he wrote his first novel and began an intense love affair with a Japanese woman. The novel, The Waterwheel, was critical of America and their brutal attacks on Hiroshima and Nagasaki, therefore ensuring its lasting popularity in Japan. Simultaneously, Simons tells the story of Edward’s early life, recounting his time as a young student of Japanese culture in London, and his relationship with his first love, a beautiful and fiercely independent American artist. These two narratives work together to reveal the innate hypocrisies of Edward’s character, demonstrating how he is capable of casting moral judgements on a large scale, while still failing to uphold them in his own life. In his ability to create a narrative which spans present and past, Simons’ writing is reminiscent of the best of Sebastian Faulks. 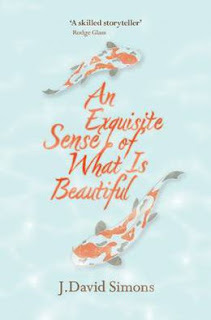 His evocation of Japan as a place of peace and beauty is sensual. However, there is something fundamentally unlikeable about Edward, and his actions sometimes seem to come out of nowhere. As a result, the end of the book lacked the force it promised. Nevertheless, An Exquisite Sense of What is Beautiful is a well-written novel, which deals with serious issues of responsibility and blame. David J Simons is certainly an author to watch out for.